Buckle Up Betsy | CowParade New Figurines | One Price Low Flat Shipping! 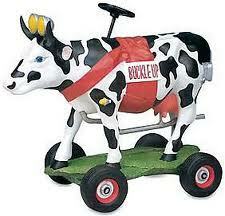 From the Cow Parade Collection, Buckle Up Betsy. Designed by artist, Joe Boeckholt. Featured at the CowParade Kansas City 2001 exhibit. Made of resin. Measures 4" x 6"
This holstein car cow is outfitted with a stearing wheel, headlights, and is mounted on four tires that actually roll!